A vintage styled decorative metal automatic toothpick holder.It's made of zinc alloy,wich is sturdy and elegant.It is not only a toothpick holder but a symbol of the life taste!It looks classic,atmospheric,antique flavour small and exquisite,lifelike,just like an antique and feels thick texture.It Can't be better.The perfect combination of applicable value and view and admire a gender and crystallization of the collision of eastern and western culture. Retro Metal Style-Made of Zinc Alloy for the Shell with Vintage Elegant Enamel Pattern on Surface;Food-Grade Safe PP Materials for the Inner Container;Durable and Ornamental! Size Detail-4.7" Height;2.7"Width;Holder only,the toothpicks in picture are not including. Multifunctional Design-Design with auto pop up toothpicks functions by lightly press the top cover.Only press gently to pop the toothpick, then press gently again to close it.And the bottom can be used as a bottle holder. Great for Home Decoration-Not only a toothpick box,but also a excellent ornament for Office,Home.Your home can be further enhanced with a touch of elegance on your desk,coffee table,reception table, guest service area etc.A beautiful piece of decor that would instantly bring luxury and glamour to your home or office. 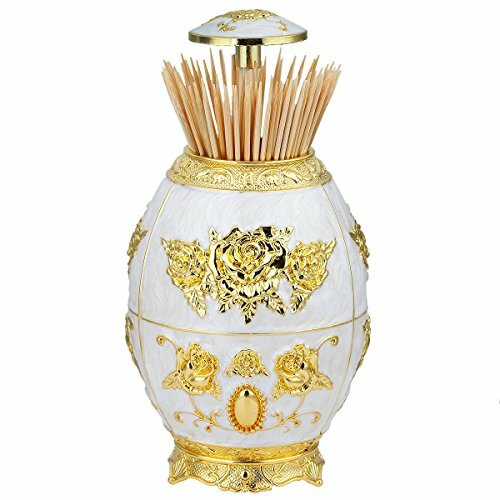 Best Gift Choice-This elegant toothpick holder makes a great Housewarming,Birthday,New Year Gift,Mother's Day/Father's Day Gift for Mother,Father,him,her,man,woman.